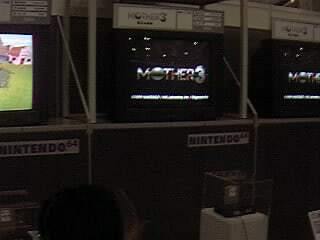 In the summer of 1999, a playable demo of the Nintendo 64 version of MOTHER 3 (henceforth EarthBound 64) was shown to the public at Nintendo Spaceworld ’99. The Internet was still young back then, and we were all naive chaps, so looking back now, it was incredibly lucky for us that one of the very few Japanese fans we were in contact at the time with attended the event, took pictures, and wrote about his experience. That fellow’s name was EXCELSIOR!, and he no longer runs a site or anything, but his legacy lives on with this information! And now that MOTHER 3 has actually been released on the GameBoy Advance and we know all kinds of details, we can look at this old EarthBound 64 stuff with a new perspective. So let’s have a look! 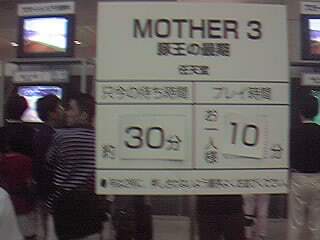 Here’s a sign that says that the current approximate wait to get your turn to play the demo is 30 minutes, and you get 10 minutes to play. That’s a lot shorter than the wait at other lines. 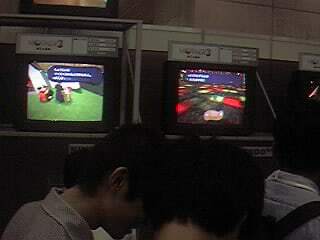 The Donkey Kong 64 line was like an hour and a half. Incidentally, EXCELSIOR! (EX for short from now on) played the demo twice. 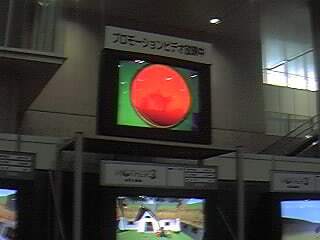 Also, it’s not very important, but there are some other tiny pics of the MOTHER 3 demo area here. Here’s a picture from the Nintendo Spaceworld Guidebook that everyone who attended got. 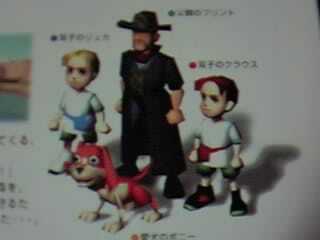 It has the 3D versions of Lucas, Claus, Flint, and Boney. I saw this same image used for in-store advertisements when the game went up for preorder in 2000, and you can see it all in nicer detail here. Here, you can see Flint talking to the equivalent of Mayor Pusher in the GBA version. On the right, we see a battle scene with some trippy colors. It’s too small to read any of the text, but it at least looks kind of fun. Here we see two battle screens. The one on the left looks a lot like an old screenshot in which you’re battling a simple boar enemy, so that’s probably what this is. The battle on the right looks pretty awesome, but there’s not much to see. These commands are found on the brown menu thing on the left. The pink thing on the bottom is the status box that tells you your HP and all that. 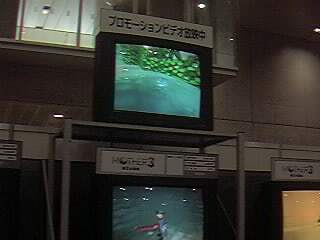 On the right we see a big item screen being accessed during a battle. Although you could see what items you had in your inventory, you couldn’t use them in the demo. You couldn’t use the Magic, Speak, or Call battle commands in the demo, either. 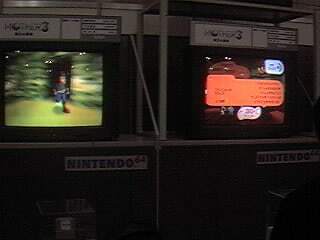 On the left screen, we see Flint running around. 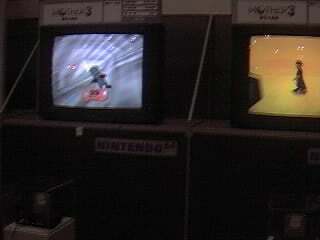 On the left we see that a player has been defeated in battle. On the right we see some more Tazmily. Here we see a battle with a Pigmask. It looks like this was from the video promo, but it also looks like there’s a guy here, playing the game, so maybe this enemy was in the demo. Anyway, you were supposed to be able to hit really hard if you tapped the buttons at the right time, but it was apparently pretty hard. Another battle. Apparently, if you snuck up on an enemy, the battle would be slightly tilted at first. Pretty odd, but maybe it made more sense if you actually saw it in action. On the right, we see Flint wandering around in what seems to be a desert-ish, cave-ish area. “You defeated the Flying Rat!” The Japanese name of this enemy is just a little different than the GBA version, which made the name into a silly little Japanese comedy reference. I guess Itoi hit upon that idea later on at some point. EX also mentions enemies called Poison Worms. Here’s a battle with a giant Pig Thing Z. Whatever this thing is, it’s appeared in the promo video and screenshots, too. Anyway, while fighting this, EX managed to hit the attack button at just the right time in the music, so the enemy was hit five times in a row. This is Flint riding in a Pork Bean in the desert. 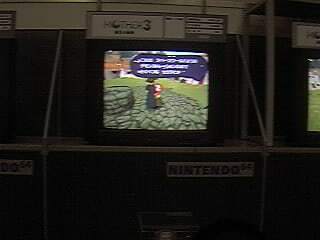 The two existing EarthBound 64 videos show this off a lot, and there were also many screenshots of this desert + Pork Bean stuff in magazines and such, so this must’ve been a major part of the game. Flint converses with a villager in Tazmily Village. The demo becomes playable after this point. 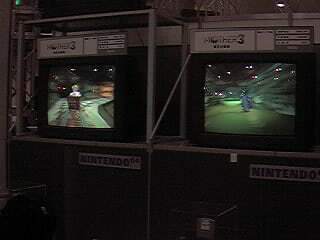 On the left we see the mine cart sequence of the promo video is playing. I have no idea what’s on the right screen, though. Looks like a cave maybe. On the left, we see the DCMC keyboardist doing his thing. This was probably from the promo video, too. On the right, Flint is encountering a Flying Rat while walking around. He’s snuck up on it. The famous scene from the mine cart sequence in the promo video. 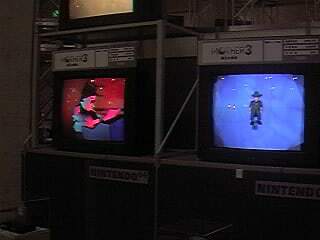 On the right we see a funky battle. More of the mine cart sequence. Too bad this never made it into the GBA version. 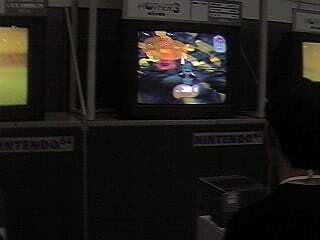 Anyway, after this part of the demo, we supposedly see Boney looking for something. Here we see some creature climbing out of the pond, as seen in the video promo. On the bottom, we see that Flint is about to enter battle with a Poison Worm. Everyone called these snakes, so I guess this is what they were actually referring to. Maybe these eventually became the Mighty-Bitey Snakes of the GBA version? Lastly, we see a shot from the promo video of the Drago running alongside some kind of vehicle, probably a train. 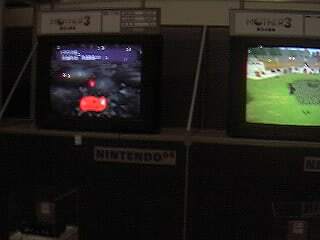 Also, don’t forget these two EarthBound 64 videos! 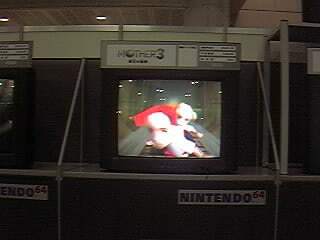 Anyway, someday we shall form a secret ninja spy society to go and steal the EarthBound 64 demo code. It is our destiny! Hah, awesome. I would have really preferred EB64 more than Mother 3, to be quite honest. I’d always wondered what it’d be like if this thing ever got out to the Internet at large. I imagine it’d be some guy wandering around NoJ’s HQ and happening upon a large library stack with old carts – and peeing himself as he stuffs blue disks into his shirt. ups on being a ninja! I know I’ll probably get flack for this, but god, these screenshots are ugly. Seems to me that Mother is meant to be played with pixels that age well rather than 3D models that don’t. Wasn’t there evidence of the “Call” command being planned for the GBA version? Ether way I would love to play the demo! I really want to know the differences and plot changes that were made. Till such a miracle happens all I can do is imagine. The project was made into a normal cartridge before it was cancelled. 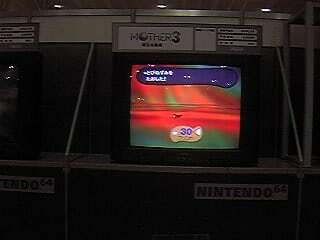 See those oddly shaped cartridges in the n64? Though I still prefer the 2D look that Mother 3 got, I always find things like concept art and beta versions of games interesting. I wish Itoi would relase some more of what Mother 3 used to look like. 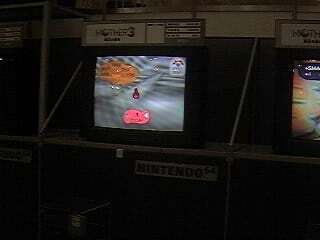 Seems like that might be the EB64 version of a Clayman. You know, if you were to form a ninja society to steal Mother 3, we’d technically be pirating it. Let’s enter NoJ and fill our scurvy infested ninja-pirate ancestors with pride. I know I’ll probably get flack for this, but god, these screenshots are ugly. Flack? Not from me – I totally agree. 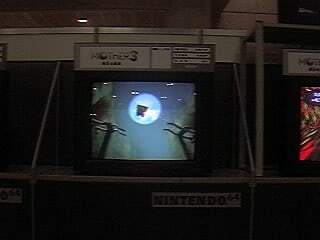 The EVERYTHING MUST BE 3D craze of the 90s was a big distraction for the whole videogame industry. 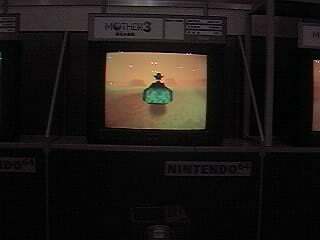 heh the holy grail of the N64. I absolutely LOVE when new info comes out about this still, like most of us. It fills that hollow void within me from when I was waiting for it. yay. I’m glad it was shipped 2D and looking a lot like Earthbound …though I will say that I would have bought and treasured the N64 game if it had shipped. gahh i wish i went to this event… though i personally prefer the gba version over the n64 version. 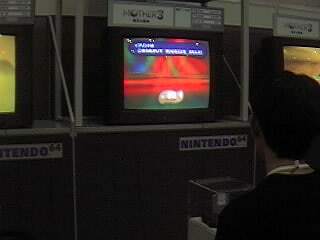 Ah, imagine a world in which instead of being a failure, the N64DD was a resounding success. Nice information you got. 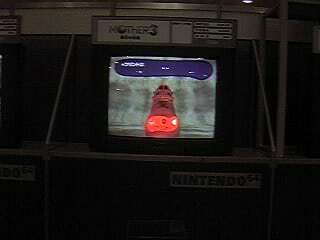 It still would have been neat to have a Mother game in 3D. I think I’m gonna write an alternative-history novel in which MOTHER 3 and Duke Nukem Forever are both released on-schedule in 2000 and inadvertently spark World War III. Anyway, as great as the GBA version is, I still so, so, SO wish I could have somehow played this. While the 3D stuff is pretty poor by today’s standards, to me anyway, from the videos at least, it looked about on par with stuff like Ocarina of Time, albeit perhaps not as refine. I’ve no doubt this game would have been fantastic. am I the only one still disappointing that Shigesato Itoi wasn’t still trying to “betray” us? @JoeWuzHere: Yeah, the oddly shaped carts are probably flash carts, like the article mentioned. Reflashable memory was pretty hefty 10 years ago, hence the larger size of the N64 carts. earthbound 64 was a unreleased masterpeice, i would giv a kidney to play the demo, if it was released would it be released in usa/europe? AAAARRRGGGHH! I really want to play that! Damn! i want to play that thing1 Why Lord? Why?! it has some advantages on 64 but the gba version is better even though im still stuck on jealous bass so cleaned my flash cart and added mario party advance and rhythm tengoku becuase for some reason mother 3 doesnt work with other roms on their besides i just want EARTHBOUND even though this game rocked. If only someone could invent a real phase distorter then I could go back in time and play the demo, probably not going to happen but I can still hope. I’m curious if there was any 3D shots of the Masked Man or was even created yet ? well I am looking there is a rom when i was younger i found it and had it on a flash drive but my house burned down and it was lost ever since i have been looking. Didn’t someone get one, and there was a piece missing, which was being sold on Ebay? Let’s all face it. If mother 3 wasn’t on GBA, Mother games would not have a style. An 8 Bit game can not have the same style as a 16 bit one, so it would’ve just been graphic enhances. hey guys i have some pretty amazing news i’ve been to nintendo and asked them about the earthbound 64 cartridges. they told me that there are no cartrides of the game but they still have the source code to the game. When they showed it to me i literally started cring with tears of joy. They asked me if i was ok and i told them that i was just really happy that the game still existed. After that i asked them so they called ltoi and he said sure as long asi treat the game with respect. Sorry my comment stopped it wouldn’t let put more words any way i got earthbound 64’s game code but i don’t know how to do it. (sigh) you think a 23 year old man would know this but i don’t which is really sad (sigh) so any way do you want to do are do you want me to give you the code. @darkashura: Yeah. Sure. Proof, or it didn’t happen, man. That’s how things on the internet work. Just because your classmates act like they believe you doesn’t mean you’re actually good at fooling people. fine if you don’t believe me tell me how to turn the games code into a rom. and wait what do you mean classmates im just know getting out of college. i not tring to fool anyone either i just don’t know how to turn codes into roms. you can make fun of me and call me a lier all you want, i mean cut me some slack here what could possibly gain for making up stuff. this web wanted the code as do all other fans so i thought why not try and get i mean did any of you even try if you did you have my respects? well fine we will see if this isn’t just some lie. sooooooooo do any of you guys know how to turn codes into roms. Just go into Nintendo’s offices and *ask* them for source code! Why didn’t *I* think of that? Kid, you might as well give up, we’re not the same gullible and easily impressed people you’ve dealt with before. Try the GameFAQs forums, you can get the people on the boards for the less mainstream games to believe almost anything, that should give you the ego boost you’re looking for. @Jungyin oh shut up. just give him a chance. this story does sound unbeleivanle, but having the source code to a game could be valuble! If we just give him a chance, and it is true, then great! and if not, then oh well! @darkashura1000 If you really do believe you have the source code, then you might want to send it to Mato. He would probably know how to get it up and running, or at least know someone who would. While I don’t really believe your story, there is a chance (however slim) that you’re telling the truth. I think we should go to 4chan, ask Anonymous to hack into Brownie Brown servers, and steal the game for us. Come on you two. A guy having been to “Nintendo”, asking about a decade old unreleased game, actually being shown the source code, and then GIVEN it, then receiving an OK from Itoi? You’re seriously thinking those poorly written posts have any grain of truth to them? If it were that simple wouldn’t someone from Starmen.net have done it a long time ago? There’s a difference between hope and delusion. Guys I no this sounds unbeleievable but yesterday I also have of the went to Nintendo and got more codes!! Does someone know how to compil them into a game pak for home computer console? This is serious. @Jungyin That’s why I told him to send the code to Mato. Mato would be able to tell if it’s a fake, or know someone who would, if darkashura would even send him a code in the first place. Of course, I don’t believe darkashura either, but I want to see how this plays out. Didn’t the guy from the team (can’t recall his name, the one White guy on the MOTHER 3 team, who did testing) say that Earthbound 64 was ACTUALLY on a cartridge in that interview? I guess we are all pretty stupid; Mato, you have obviously wasted a lot of time, why didn’t YOU ask Nintendo for MOTHER 3’s source code? While you’re at it get Pokemon’s source so we can make new Pokemon games too. @Schlupi Yes, that guy on the MOTHER 3 team did say that Brownie Brown still had a cartridge with most of Chapter 1 and some cutscenes from EB64 on it. It’s anyone’s guess as to whether they still have it and haven’t thrown it away or overwrote it by now, though. I, too, wonder if Mato ever asked Nintendo for the source code. It is very unlikely that they’d willingly give it out, though. Heh, these rumors about random schmoes stopping by and picking up the source code amuse me. Honestly, I don’t believe rumors like that, but anything related to EB64 interests me. hey guys i have a question when a game has a source code what would it look like? oh wait guys i was wondering do anyone of you even know how to hack into nintendo and and get the code? um guys im back and i came to tell you that the i given the source code to one of my friends on facebook because he said he has has experience with kind of stuff. HURR DURR I WENT TO NINTENDO TOO AND GOT TEH SOURCE CODEZZ!! Well, you know, there’s a chance (a really, really slim chance) that this darkashura guy DOES have the source code for the game. Oh, man, I can’t believe I said this… SOMEONE SET ME ON FIRE!!! Doesn’t look like darkashura sent the “code” to Mato, but rather to a mysterious “Facebook friend.” I think it’s pretty obvious now that he’s just joking about the code. Darkashura, I’m pretty skilled when it comes to N64 matters, and I track down/work with unreleased games as a side hobby of mine. That being said, if you could send me the source code, I would be eternally grateful, as I am doubtful as to its authenticity. Fake roms/source codes for unreleased and prototype games are all too popular these days, and I would like to confirm that your code is the real deal. Please at least let me look through it to know whether this is really something to get excited over or another ‘Blue Discs’ incident. If you really do have the source code, please send it to me at thisremindsmeofapuzzle@gmail.com so I may see if I can get it running. I won’t spread it or share it with anyone without your consent, I just want to try my hand at making it playable. Thank you. hey guys forget darkashura10. im going to get the game code myself by trying to hack into nintendo do anyone want it will be our little project. but first tell of the idea. I know you probaly think “dude what is wrong with you” but darkashura10 is a let so why not at try. if you think it is a good idea say PK. if think it is bad say PK NO WAY. oh yeah i’d appreciate it if you answered. oh one mare thing i just want to say think you you guys are the first people i’ve seen weren’t so stupid to fall for stuff like this. Not that it’s not already obvious to most people here, but pretty much all the poorly-written comments here are the work of one kid. In general, it’s best not to pay such attention-seekers any notice, even if it’s obvious they’re idiots. @darkashura1000 well is it real or not? were did you get all those photos from!!!!!! I wonder to see rearranging MOTHER 3 HD comming up to Wii U and 2DS like Sonic Boom and SSB4.